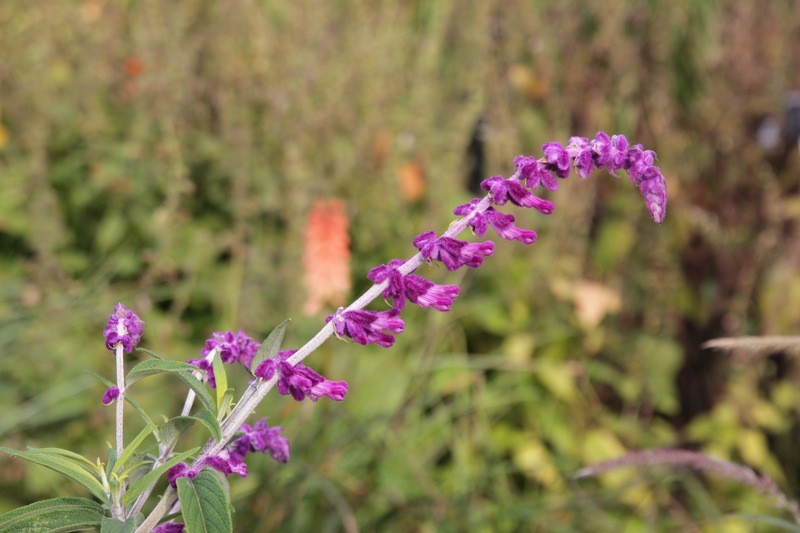 Salvia leucantha is a native of the temperate and semi temperate conifer woodlands of Central and Eastern Mexico. It is Hardy down to -5c or is supposed to be, we here in the uk tend to grow it as a half Hardy plant, putting it out into the garden in late summer and then bringing it in towards the end of October, before the serous frosts occur. It is a natural herbaceous plant that sometimes can be come a more of a woody semi shrub, especially if repeatedly lifted and repotted over a number of years. Even so it doesn’t tend to get much bigger than 4ft in a hot summer. What makes this plant so special to me is just how tactile it is, the long thin greyish green leaves are so soft and have fine hairs on them but the flower heads are just to die for! Long and so soft, with the dark purple colour even more noticeable over the greyness of the flower head. The ‘Santa Barbara’ form is slightly smaller than the main form at around 2.5ft tall making it idea for the smaller gardens and the flowers are even darker than the main plant. It first occurred around 1999 when it was discovered growing in Kathy Ann Brown’s garden in Santa Barbara, a Nurseryman Randy Baldwin of San Marcos growers then started to propagate it and sell it. It is pretty easy to grow in most gardens and will take spots from full sun to slight shade in most free draining soils, although I have struggled with it on thin chalky ones in the past. It makes a cracking plant for a pot as well, either on its own or indeed with other plants. It does need over winter protection but it is also pretty easy to propagate using semi ripe cuttings taken around now. It doesn’t have any pests other than slugs and snails. Pruning is easy, just take it back to the old frame work in April or just remove any dead stems at the same time. It can be brought from places like Haycroft Plants. Next post: Autumn is coming, autumn is coming!